TIRA GAS is one of the biggest industrial gas supplier in Indonesia with 22 sales office with its main focus to market and to sell in Java and Sulawesi with the expansion to Sumatera, Kalimantan and Papua. The products sold by TIRA GAS are atmospheric gases such as Oxygen, Nitrogen, Argon, processed gas such as Carbon Monoxide, Sulphur Hexafluoride, and mixed gases for certain application based on customer demand. The gases and the technology provided by TIRA GAS are used in many industrial sectors - to preserve food, to make production process more efficient, as a medication in hospitals, to provide sizzling effect in soft drink industry, and as fuel for air ballon for promotion and so on. TIRA GAS has 9 filling station and provides the product through the production facilities spread from Cikarang, Bandung, Tegal, Semarang, Yogyakarta, Gresik and Banyuwangi in Java and Makassar and Palu in Sulawesi. For acetylene gas, TIRA GAS has its own facility in Tegal (Central Java) and the production capacity is 100 canisters per hour. 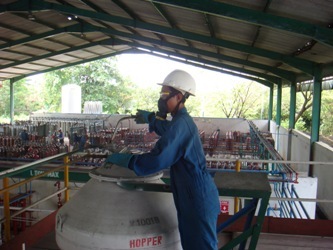 All finished goods are checked in the sophisticated laboratory facility of TIRA GAS to make sure that they met the specification and product standard. To efficiently deliver the gas, we increase the density in order to decrease the volume. For that reason, there are two main modes for the transportation. Gas is densed to 150 kg/cm2 and then put in the steel canister. Or gas is liquified by lowering the temperature to -183⁰C for Oxygen, -196⁰C for Nitrogen, and -186⁰C for Argon, then the liquid is transported to the customers location and is kept in a special tank. TIRA GAS delivers the product from the production facility via the branch or distributor all over Indonesia. Besides selling the gas, TIRA GAS also provides gas installation service for industries or hospitals, purging for tanks or pipes, hydrostatic test for steel canister, and supplying other gas equipment. TIRA GAS commitment to a world class has been recognized by International Standardization Organization (ISO). In October 2010 TIRA GAS has received a comprehensive ISO 9001:2008 certificate that recognized production activity, operation, distribution, and customer service. This certificate confirms that TIRA GAS quality system is consistent no matter where the gas is produced.